Built in the early 1880's. then known as John Ryan's Pub, the Fairport Village Inn has been a favorite town gathering spot for more than 100 years. After John Ryan sold the business near the turn of the century, the building was divided into two parts. The Larger part was converted to the town grocery store, while the smaller section housed the local barbershop. 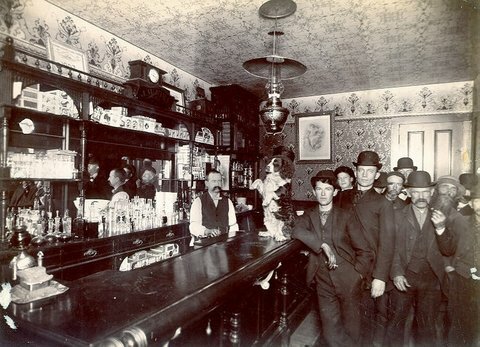 Years later, the building evolved into a small inn and local tavern, where railroad workers and travelers alike would gather for a hearty ale, a fine meal and comfortable lodging. Since 1976, Wayne, Patty and Ken Beckwith have worked hard to continue the fine tradition of this local eating and drinking establishment. In September of 2016, Wayne and Patty sold their interest in the business to Ken who now is the sole owner/operator. So, if you enjoy the camaraderie of a friendly local tavern, the excitement of a crowd cheering for the home team, the Fairport Village Inn may be just what you're looking for. We're open for lunch Monday through Saturday and the late night crowd starts gathering just after dinner. From Tuesday through Saturday, the Fairport Village Inn turns into one of the area's finest restaurants, serving a delicious variety of seafood, chicken and beef dishes made to order in our kitchen. On Fridays, you'll find the place teeming with fans of the fabulous Fish Fry Dinner. Delicious prime ribs are served Thursdays and Saturdays. To those Merry Souls of the other Days..
who again will make drinking a pleasure..
who achieve Contentment long before capacity..
and who.. whatever they may drink..
prove able.. to carry it.. enjoy it..